Note! - pressure is "force per unit area" and commonly used pressure units like kg/cm2 and similar are in principle not correct since kg is a mass unit. A mass must be multiplied with gravity g to be a force (weight). 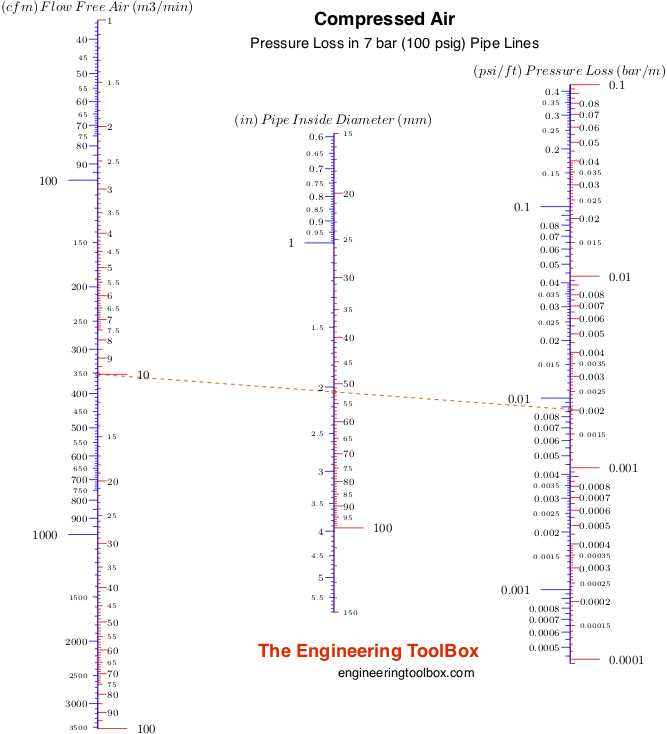 The nomogram below can be used to estimate pressure drops in compressed air pipe lines with pressure 7 bar (100 psig). 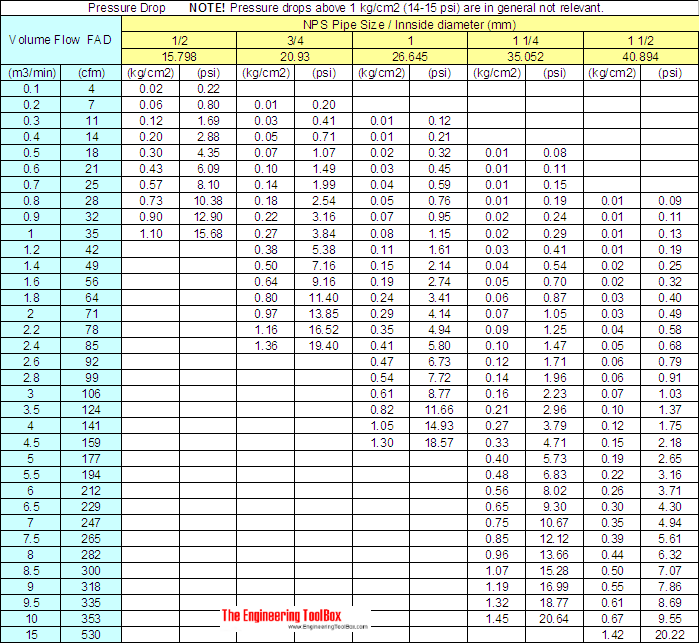 Download and print compressed air pressure drop nomogram! The calculator below can used to calculate the pressure drop in compressed air pipelines. NOTE! - a pressure drop above 1 kg/cm2 (14-15 psi) is in general not relevant and the formula and calculators above may not be valid. For a more accurate calculation - or for a longer pipe lines with larger pressure drops - divide the line in parts and calculate the pressure drop and final pressure for each part. Use final pressures as initial pressures for the next parts. The final pressure after the last part is the final pressure at the end of the pipe line. The pressure drop for the whole pipe line can also be calculated by summarizing the pressure drops for each part. 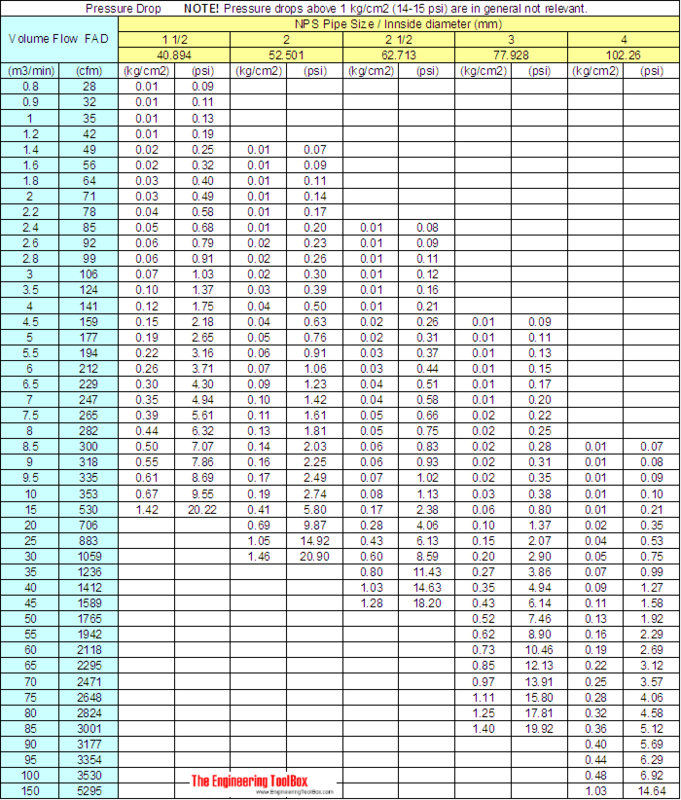 Calculations can be done for other pressures and/or pipe lengths by using this excel spreadsheet (metric units). The same spreadsheet including different types of pipes (imperial units). Or, alternatively - Compressed air pipe lines - pressure drop calculations - in Google Docs. You can open, save and modify your own copy of the Google spreadsheet if you are signed into your Google Account. Engineering ToolBox, (2005). Compressed Air - Pressure Loss in Pipe Lines - Online Calculator with Metric and Imperial Units. [online] Available at: https://www.engineeringtoolbox.com/pressure-drop-compressed-air-pipes-d_852.html [Accessed Day Mo. Year].